Today is “Organize your Home” Day, and we all have common household items lying around collecting dust and taking up valuable storage space. What about those old trophies that you no longer need or want? 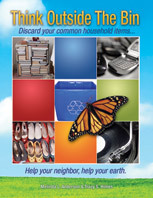 Consider donating and decluttering! For over 35 years Lamb Awards has been a full service trophy and award company, and they accept your used trophies, plaques and medals as donations. They refurbish them, use them for charitable needs or simply break the parts down for reuse for other trophies. This entry was posted in Social Recycling, Trophies and tagged donate trophies, Lamb Awards, Organize your home day, think outside the bin, trophy recycling, what to do with trophies. Bookmark the permalink.